Voted best guitar solo ever, so get ready for a face-melter! Thanks to Andrew for the hookup. I remember this blaring out over the kitchen speakers as I began to develop a taste for music. These guys were the soundtrack to my summer last year – nearly that time again! So there we have it, people – thirty songs that mean something to me in (at least in some small way). I hope this has been at all enlightening, it’s certainly been fun to put together. Don’t forget, you can always submit new music to me by adding to my collaborative Spotify playlist. 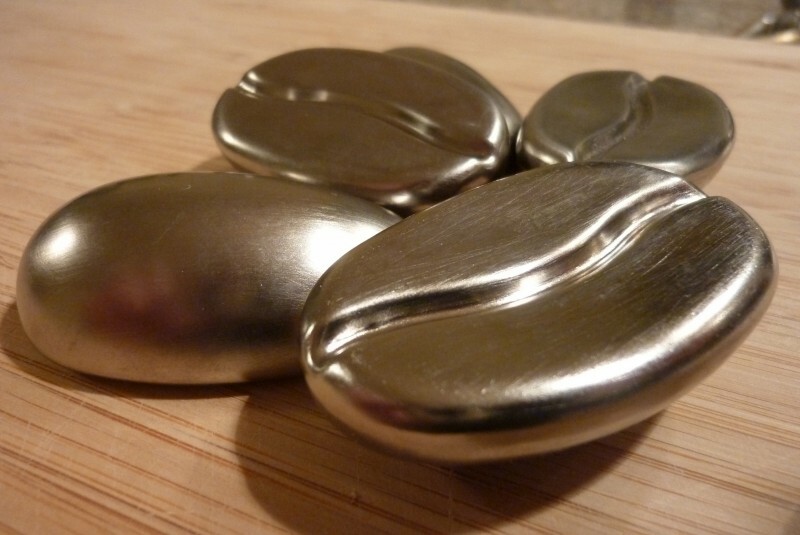 Coffee Joulies are a new invention that reduces and sustains the temperature of hot drinks, while looking pretty awesome in the process. Their inventors are “two Daves” from New Jersey, who have engineered, prototyped, and produced their first run of units over the last eight months. They absorb excess thermal energy when the coffee is initially poured too hot to drink, cooling your coffee down to a drinkable temperature three times faster. Once your coffee reaches the right temperature the beans release that stored thermal energy back into the coffee, keeping it in the optimal temperature range twice as long. Thanks to Tom Allen for the link – reckon I might try to get a hold of some! Right then. What have I been up to? Lots of cool, creative and techy stuff for MediaCom and MBA. Went on an Android development course, and made an Asteroids game! Moved to Ladbroke Grove from Clapham South. West is best. Joined Foursquare and learned to love it. Tried and failed to make a Foursquare widget for bloggers. Joined the Gym – tickets to the gunshow now on sale. Did a bit of consultancy for Moviestorm and Optricks Media. Went on a few awesome nights out, inc. the Viral Video Chart relaunch. Found some simply stunning new music which I’ll share with you soon! Tried a pickled herring sandwich in Amsterdam. Flew to Berlin and back again in a day. Watched about a million films. Proclaimed Warren Ellis the best comic book author of all time. Created Digital Cortex Lite and filled it with interesting content tidbits. Constantly tweeted across numiferous topics. Redesigned Digital Cortex using the Thesis theme. Bookmarked loads of interesting stuff to share with you here. So quite a few things really. But please accept my apologies! I’m ready to be a better blogger. Starting now. Stay with me. Grab the feed. Let’s try this thing again. Posted on June 30, 2010 March 24, 2011 Author Tom SaunterCategories BloggingTags android, Comics, consultancy, Design, films, life, list, mba, mediacom, tom, travel1 Comment on Digital Cortex Is Back! !